The unit we stayed in was well stocked with anything you might need during your stay. The unit was easy to access from all parts of town and very nice. We are a family of four and this more than met our expectations. The views are 2nd to none and working with the rental company was a breeze. Definitely will be back to stay here again. With captivating views of the Bay and Lover's Point, these oceanfront residences are a recipe for a great vacation. Swim, dive or kayak at Lover's Point cove across the street (with a white sand beach for sunning, a kiddie pool, beach volleyball court, snack bar, and grassy areas for picnics, this park is a favorite of visitors and locals alike). And once you're completely relaxed, Pacific Grove is convenient to an amazing range of activities on the Peninsula. Within minutes you can be touring scenic 17-Mile Drive, hiking to secluded Big Sur beaches, horseback riding, deep-sea fishing or whale watching. Play golf at the oceanside Pacific Grove Golf Course, affectionately known as a "budget-minded alternative" to Pebble Beach. Or stroll down the coastal recreation trail just outside your front door and commune with seals and sea otters. The shops and restaurants of downtown Pacific Grove are just three-blocks away. For an even more varied dining experience, a longer walk or a short drive will take you to Cannery Row, Fisherman’s Wharf, downtown Monterey or Carmel. The well-equipped kitchens of these residences feature maple cabinetry, granite countertops, and stainless GE Profile appliances. Cable television and DVD players are provided, as is high speed internet access. Bedrooms are furnished with king, queen or trundle beds flanked by reading lamps, as well as flat screen TVs. Baths are equipped with a granite vanity with dual sinks and a shower over tub. Each unit is heated by central forced air and includes a GE SpaceMaker front-loading washer and gas dryer. Carport parking behind a security gate is conveniently located near the entrances to all units. The residences at Lover's Point accommodate up to four in one of two plans – a townhouse style or a flat. The "townhouse style" dwellings feature exterior stairs to the second level of the three-level building. The living room, dining area, kitchen and a half bath are on the entry level; two bedrooms and a full bath are downstairs at ground level. Each townhouse has a deck off of the living room that frames picture postcard views of Lover’s Point and the Monterey Bay. The "flats" are accessed via exterior stairs to the third (top) level of the building. The living, dining, kitchen, two bedrooms and a full bath are all on one level. These units have stunning, panoramic ocean views from decks off both the living area and the master bedroom. Note: This is a non-smoking building and no barbecues are allowed. Stairs from bedrooms to living area above. All was good, parking was difficult as very cramped parking at stay location. A really nice property. Coming from a hotel room the night before, this was a really spacious condo! -Lots of space and great view.-Kitchen is well stocked with pots, pans and cooking items and very easy to use.-Washer and dryer included-Location is amazing and a super easy (and beautiful!) walk to downtown Monterey and the aquarium-The emails from Monterey Rentals are very thorough about how to get the keys, what you need to do, and how to check out. -Check in and check out process is super easy.-Everyone we met at the condo complex was very nice. Cons:-The assigned parking is very tight (that seems to be a normal thing in Pacific Grove)-No AC (they don't claim to have AC, but just wanted to put that out there). However, there are fans available in the unit.-We randomly had a bag of linens dropped off in a garbage bag at our front door with no note and no explanation. A quick email clarified the situation, but it was still weird. Overall, a great place to stay for your visit to Pacific Grove/Monterey/Carmel. Wonderful accommodations, in a great location! Walk to Cannery Row, and downtown Pacific Grove. Very clean, everything you need. Would definitely stay again! Great condo for perfect view of the ocean!!! Within easy walking distance of everything and perfect for singles or a small family! Nothing but excellent service from MBPM and the entire team. Will stay here again and use this Property Management Company for any and all rentals. Great location,super view.very nice inside.perfect place to stay central to all things in the area.Be aware of bedrooms on lower floor with steep staircase if physically challenged.Luxurious ! Great place to kick back. Perfect location. Everything you need. First and foremost: the location is superb; perfect for my wife and me both for ambling and people watching on Lovers’ Point and for longer walks on the Monterey Bay Coastal Trail. We could walk to the Aquarium and for groceries & restaurants although Fisherman’s Wharf was a bit far for us. The unit itself is very well appointed having everything we needed for a comfortable stay including the best TV/cable system with PVR I have encountered. Ever. Could be improved: a few instructions would be helpful. For example, a list of TV stations (one of the few places I have stayed without) and A/C directions. We figured out everything ourselves but a little help would be nice. The pre-arrival guidance including driving directions were excellent. And while the unit had been well cleaned before our arrival it really could use a good spring cleaning. A little elbow grease would not be out of place. Back on the plus side: maintenance response to a small problem was lightening fast. They were on our door step almost before we could hang up the phone. Client satisfaction is clearly a priority. Overall, a very nice unit; I would not hesitate to return. Such a beautiful condo. Very clean. I already have reservations at the same condo for February! Property management people so kind. I had to call Shane for a shower issue he was there in 15 minutes he was also awesome too!!!! This was our second time here and we liked it very much. View is wonderful and short way to the beach or center of the town. Kiitos ! Nice rental for an enjoyable week! Nice, comfortable condo especially for couples. Great location across from Lover's Point. There is traffic on the neighboring road during the day, but much less so at night. Also, bedrooms are downstairs, so the condo cannot accommodate those with disabilities. Nicely furnished and comfortable, has everything needed for a carefree week. We travelled from the uk and having never stayed in an apartment before we didn't know what to expect. We were blown away. The apartment was in a fantastic location at Pacific Grove, lovers point overlooking the beach. It was clean, comfortable and felt like we were walking into a showhome. We had a great range of shops and restaurants in very easy walking distance and we were able to walk into Monterey, fishermans wharf etc within 45 minutes - slow! The service from the team was superb, excellent value for money. Well certainly be back. The rental at Lover's point was easy and quiet and right across the street from the ocean. All for a very good price. Booking was immediate, getting key was easy, access was easy, and place was very much as expected. Close to stores and beaches and Point Lobos and Aquarium. Would definitely stay here again in Monterey. Our family had a wonderful weekend at the Lovers Point condo. The location is great, the kitchen was well stocked and the place was bright and clean. We enjoyed watching whales breach from our deck. The location to downtown and the aquarium is ideal, we were able to walk everywhere. There was always action to watch from the front balcony. Would definitely book again! Stay was pleasant and my girlfriend and I hand a wonderful time. Kyle was very attentive and willing to accommodate last minute changes as a result of my job. I had a wonderful time and would most definitely recommend this stay to my friends. We have been coming up to Monterey Bay/Pacific Grove area for my son's fall break regularly; to visit the aquarium and enjoy peaceful time away from the hustle of day-to-day life at home. This condo, was our favorite yet! They thought of all the "home away from home comforts" from toiletries to towels it was all lux! The linens were wonderful, the cable tv & wifi were top-of-the line quality. The view is spectacular! The short walk to the beach & tide pools are a super plus! We thoroughly enjoyed our stay here, and we hope to rent #1 in the future! I stayed at Lover's Point three out of my six day vacation. My only regret is that I didn't stay the entire six days at Lover's Point. Monterey Bay Property Rentals is great: staff friendly, check in and out done in less than five minutes, directions and explanations easy. The property was clean, view beautiful, location great. I'll be back in March. Thank you so much. A Wonderful Week in a Perfect Location! I give it 5 stars for the following:PROPERTY:1. 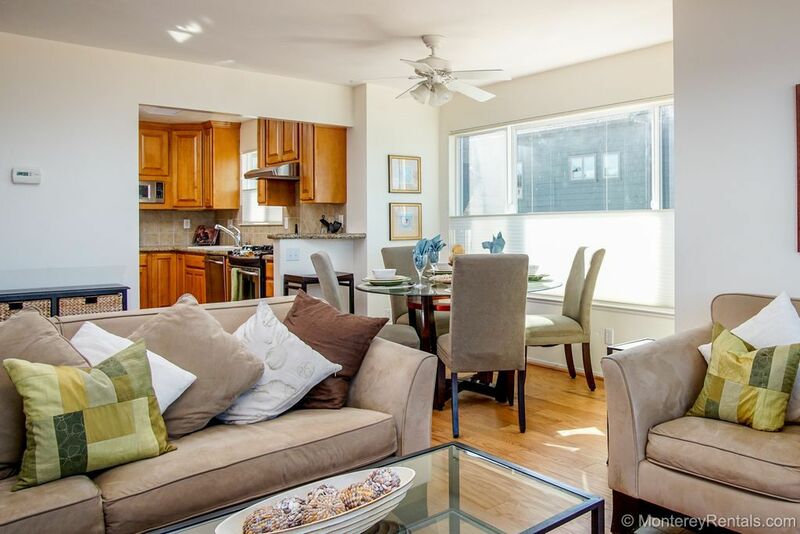 Very clean with modern furnishings including nice dishes, pots/pans and appliances.2. Very easy to obtain the keys to the property and the property management company was very professional to work with. Everything was seamless.3. The view from the balcony.4. On site secure parking for one car.5. Outside shared eating area with umbrellas.6. Very quiet at night.7. You need to be able to climb stairs in this house, so take that into consideration if there are really little kids or physical issues. My kids were 3 and 4 so the stairs weren't an issue but if they were toddlers, I might be a little afraid given it is 2-stories.8. We brought our own beach items; however, I did not see beach items to borrow. If you have this expectation, I would bring my own to be safe or talk to the management (maybe I missed something). LOCATION:1. Kids can walk right across the street to a nice calm beach area and pick up shells, etc.2. Bikes, surreys and kayak rentals are right across the street.3. There are restaurants adjacent within a very short walk.4. From this property, one direction is the beach and the other direction (walking) on Monday's will take you to the Farmer's Market and a little further down the road is downtown Pacific Grove for coffee and breakfast, lunch, dinner, or shopping. No need to drive! Not to mention the nice pathway to walk to Cannery Row along the water.5. Close to the best restaurant (my opinion)....Passionfish (also 5 stars). Red Door is also a very good option. I love both.6. Close to Asilomar State Beach which is gorgeous and Asilomar conference grounds which is very peaceful to walk around.7. A quick drive to Carmel for wonderful restaurants, shopping and gorgeous beach there! Do not hesitate to rent this property - you won't be disappointed! Sweet view. Enough action during the day and calm in the evening. Kitchen was perfect. Trundle bed should be replaced with a queen . Only one parking spot, but we found parking on street. Cleaning fee was a bit steep IMO. We left the place clean, but maybe they have to compensate for those that leave a huge mess. All in all a place we would rent again. Our family of 4 stayed 3/18 thru 3/24 and without a doubt, the best feature is the location...now the view is fraction behind!Our kids actually watched the ocean, more than tv! !This unit is ideally located next to Lover's Point and the beach alcove that is tremendous for families, but especially younger kids as the surf is more tame. We were a mile walk along the beautiful coast to Cannery Row and the Aquarium.Picking up/dropping off the keys were painless and the staff was friendly.The condo is well kept, but had a couple minor issues that Kyle was made aware of and was very responsive. The condo and location were great. The unit is very nice, and slept our family of 4 well. We used the BBQ to grill up some fresh fish from a local market one night, and were within a short walking distance to many other restaurants. It's a pleasant 15 minute walk to Cannery Row. The location is also very friendly. Lover's beach is just across the street and the kids were able to swim in both a pool and the ocean (though the ocean was chilly). I'd go back here again for sure. I stayed here with my pregnant wife and two children, did not disappoint, everything was as pictured on the website, beautiful view. Our stay was comfortable, clean, we had privacy, very relaxing. Only one small critique, shower could use a new shower head but besides that everything was great, would definitely stay here again! Location of unit is ideal, walk to beach, town, and on bike/walk trail. Great ocean view from upstairs. Kitchen very well equipped. Secondary bdrm twin could use an upgrade for the mattress. Note a low humming (probably from exterior water heater) in secondary bedroom, but not loud and becomes white noise. Living room furniture comfortable. Parking is a bit tight, but you have a dedicated spot and don't have to search for street parking. Wonderful park/playground/basketball court for kids a few blocks away. Lovely and relaxing stay. Perfect. We booked everything for our Lover's Point condo remotely, so we were unsure what we would show up to. However, everything was perfect. Seriously, perfect. The condo was clean, beachy, and well-equipped. Everything, aside from groceries, was provided. My husband and I were traveling with our two-year-old, and there was a quiet, comfortable room in the back for him, as well as a great master bedroom for us looking out on the beach. Most importantly, the location of the rental was amazing. We were across the street from the Lover's Point beach and had an amazing view from our balcony--we were, literally, the closest property to the beach. Every morning, our little one would come upstairs for breakfast and hardly be able to contain himself, wanting to go visit "his beach." We were also able to walk to attractions in Monterey, including Cannery Row and the aquarium, while enjoying the lower-key atmosphere or Pacific Grove. We will definitely be returning to Pacific Grove and, if luck is on our side, this rental. Highly recommended.